I was hosted at Great Wolf Lodge New England for the day. 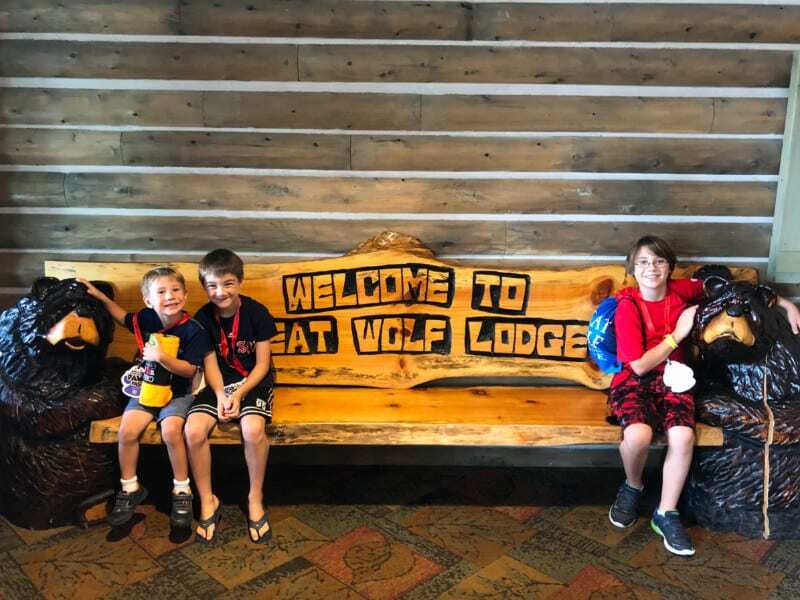 My kids have been dying to check out Great Wolf Lodge New England forever, and we were finally able to make the trip up for a media event a few weeks ago. To say they were excited would be the understatement of the year! It took about two hours to drive from the Cape to Fitchburg and thankfully we didn’t hit much traffic! 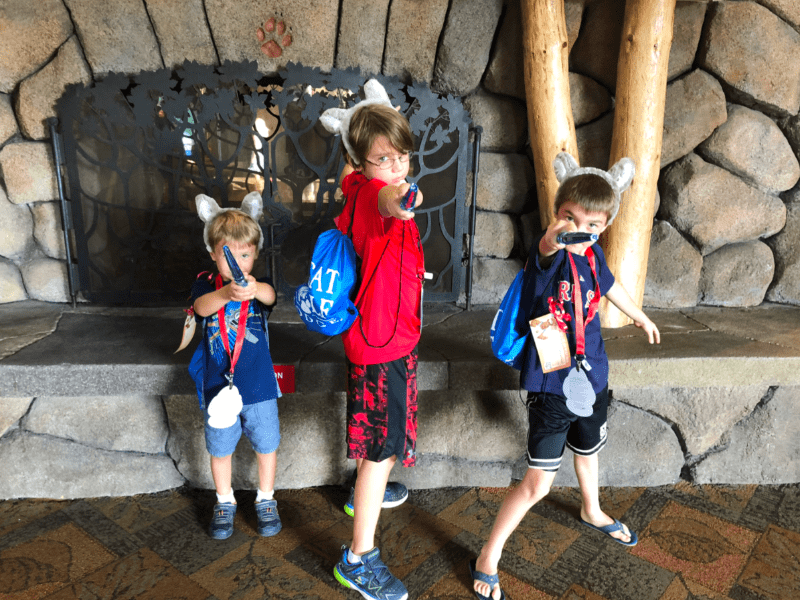 Shortly after our arrival at Great Wolf Lodge the boys had their Wolf Pack ears on and were ready to see everything the resort had to offer before our scheduled lunch. 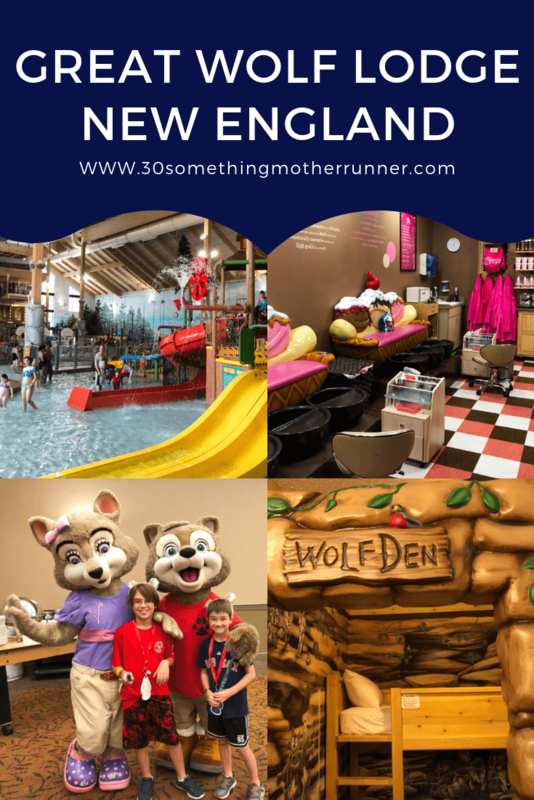 For those of you who haven’t visited Great Wolf Lodge New England yet, there are a TON of indoor activities to keep the kiddos busy in addition to the water park! I was really impressed with how many dry-land activities there were to do at the resort in the Howlin’ Timbers Play Park and we tried to squeeze as many in as we could during our day at the lodge. 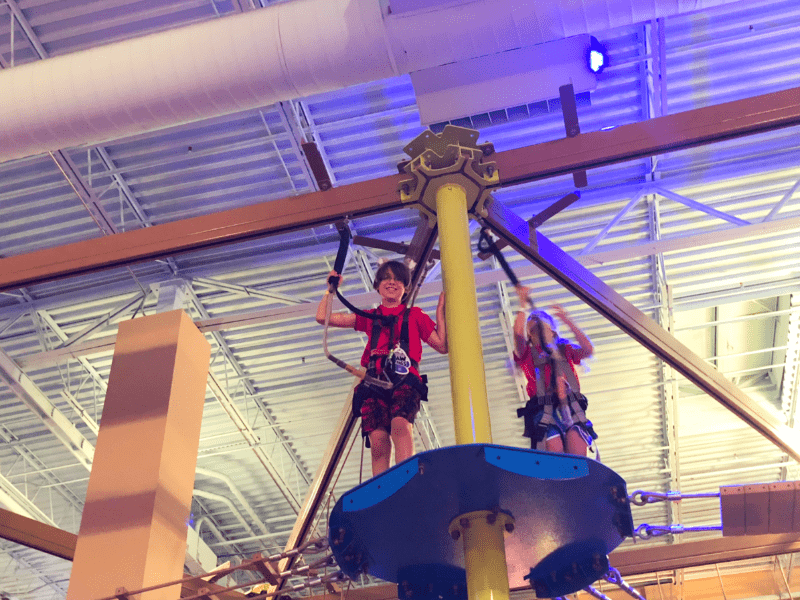 All 3 boys loved the Howlers Peak Ropes Course (indoor)– we actually did it as a family! After the climbing, we visited Oliver’s Mining Co. and then headed off for a yummy lunch with the group. While I took a tour of the accommodations, my husband and the boys went to play some putt putt at Howl at the Moon Mini Golf. There are plenty of indoor activities to keep kids of all ages busy and I would definitely look at the combo deal that allows you to purchase a pass that includes most of the Timbers Play Park activities at a discounted rate. If your kids love to play arcade games, you’re in luck because the Northern Lights Arcade at Great Wolf Lodge is open 24/7! The whole family can play games and earn Paw Points to redeem for prizes. You can also opt to relax in the ice cream-themed Scooops Kids Spa, where you can enjoy ice cream-themed fizzy soaks, sherbet scrubs and manicures/pedicures. The two older boys LOVED Magiquest. This interactive game starts with the purchase of a wand and any additional special powers before setting off on your own magical quest! You can choose from different adventures that take you around the lodge. You can choose your own wand and special powers for your MagiQuest! I love that they have added a Mini Magi Mode for kids 5 and under, so they can use their wands to point and open treasure chests, make animals move and other fun tasks– it’s perfect for them to play while older siblings are off on quests that can take anywhere from 30 minutes to 3 hours (don’t worry, you can stop and start whenever you like)! 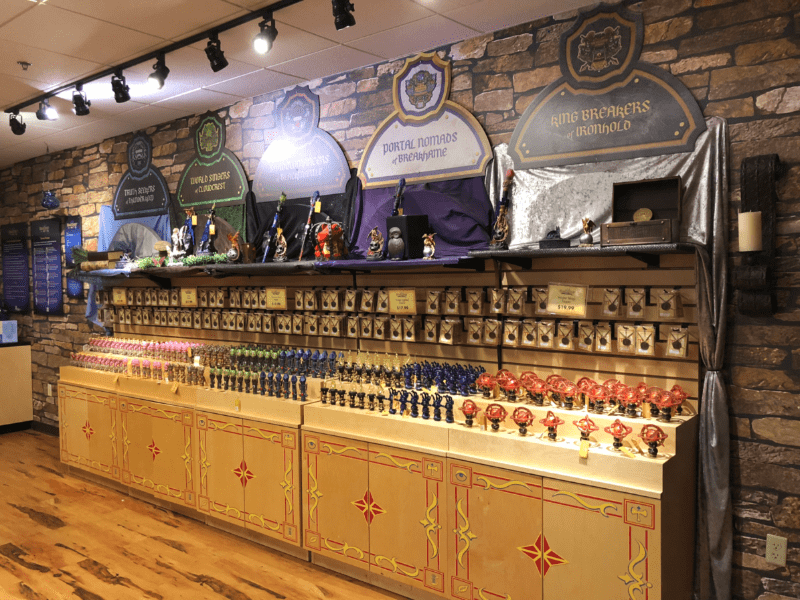 You can keep your wand and bring it back on your next visit to play again! 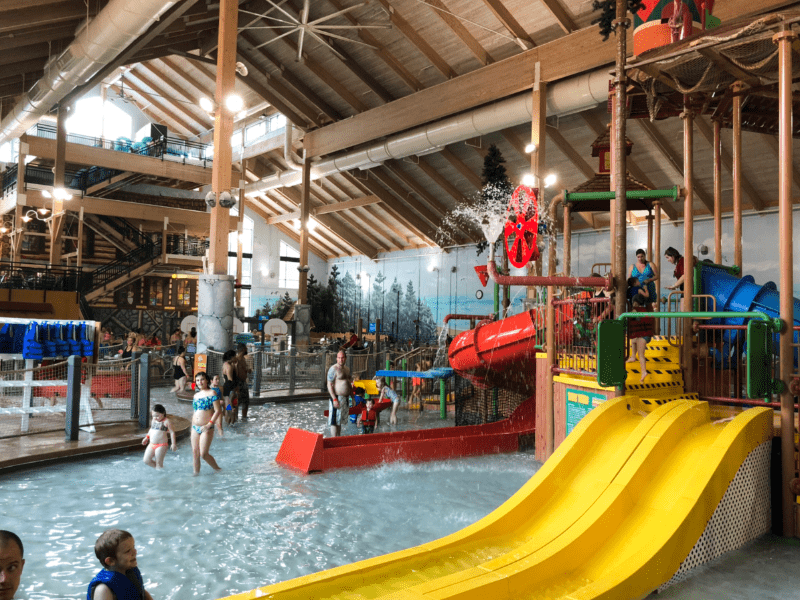 The major draw of Great Wolf Lodge is, of course, the water park! There are water parks on two sides of the lodge and I love that there are water activities for all ages and abilities. 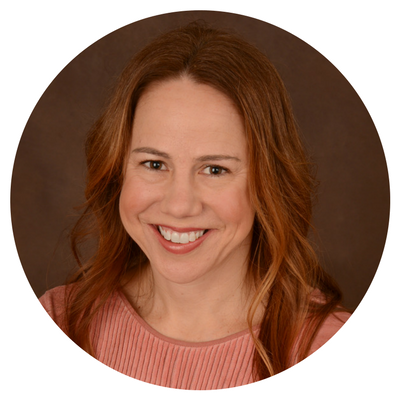 Since we have a 4-year-old, 8-year-old and 10-year-old it can be challenging visiting parks because the 4-year-old isn’t quite tall enough for a lot of rides and attractions. At Great Wolf Lodge, there were slides and water activities that the 4-year-old could participate in as well and he was SO HAPPY! 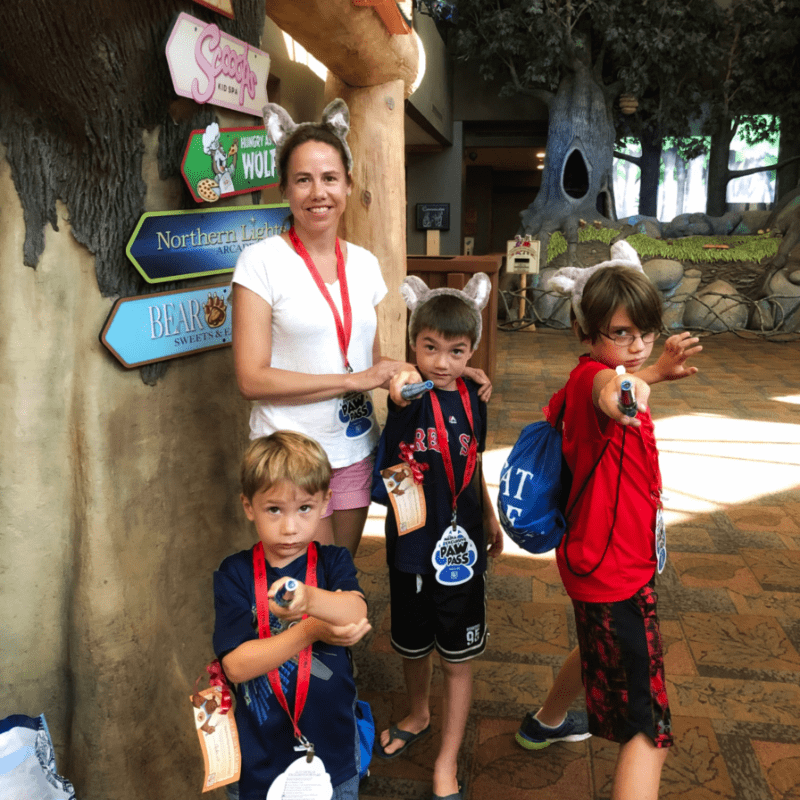 The boys’ favorites were the Wolf Tail (features a thrilling 20-foot drop and 360-degree, high-speed loop), River Canyon Run, Whooping Hollow (perfect for toddlers) and the wave pool. You can reserve cabanas, which are great for having more space to spread out with your things, a small table to eat, safe for storing valuables and a small mini fridge with refreshments. 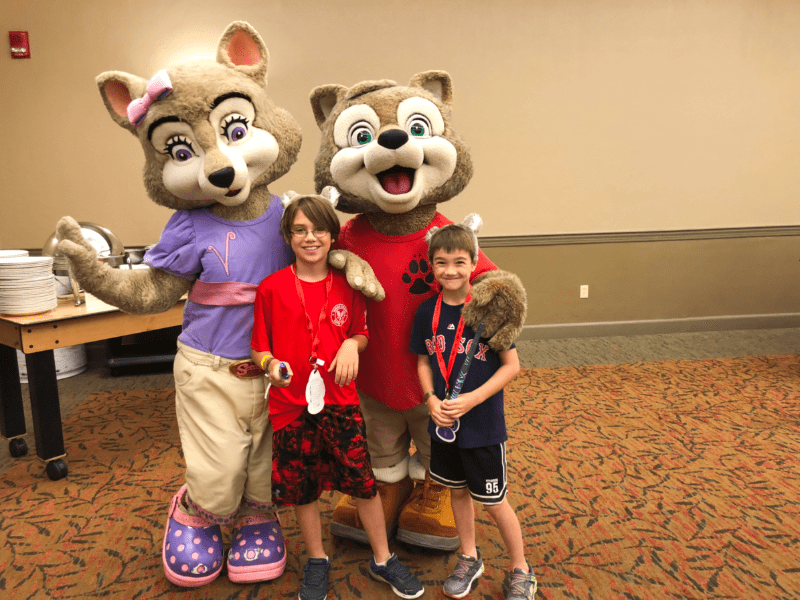 There are a number of different dining options at Great Wolf Lodge New England including the Lodge Wood Fired Grill, Hungry as a Wolf (pizza, salads and pasta), Dunkin’ Donuts, Buckets Incredible Craveables and Bear Paw Sweets & Eats. There are many options for sitting and dining or grabbing something to go while you play! When you’re finally done playing at the water parks and all of the other fun indoor activities, you’ll want to retire to your room. 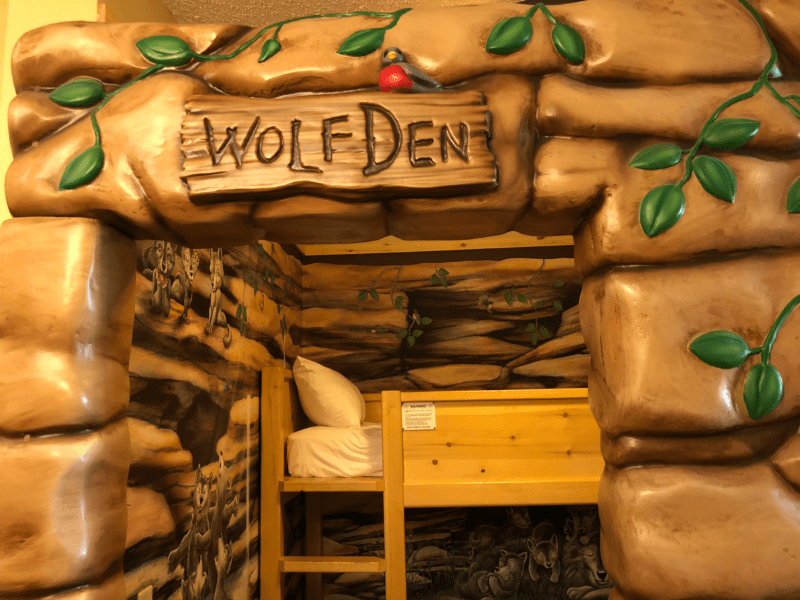 Accommodations at Great Wolf Lodge New England include standard, themed and premium suites. You can view all of the many options HERE. 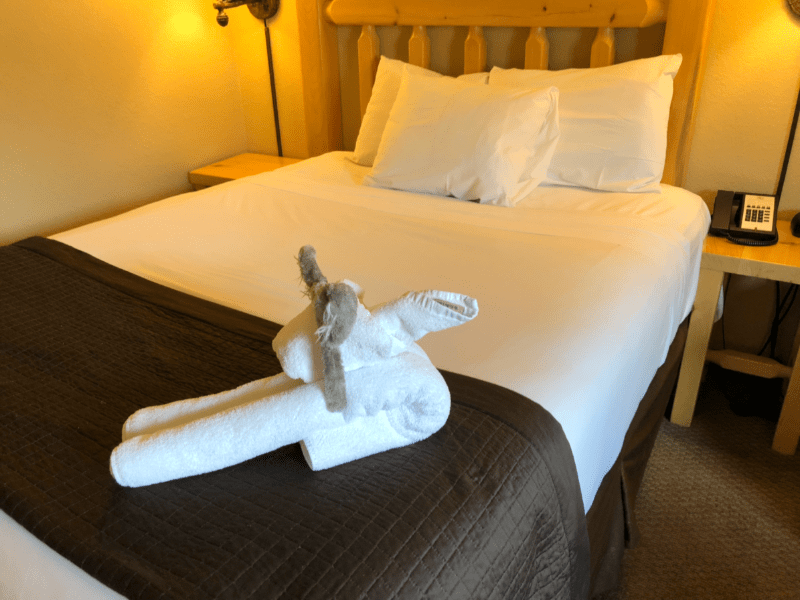 We got to view one of the Junior Cabin Suites with the adorable log cabin-themed sleeping area for the kids, complete with bunk beds, a day bed and their own TV! Ready to plan your trip? Don’t forget to check out their special offers! Previous Post: « Get Back-to-School Ready with Tom’s of Maine®!